Henley Honda | 2017 | Civic Type R To Go On Sale July 14! Civic Type R To Go On Sale July 14! 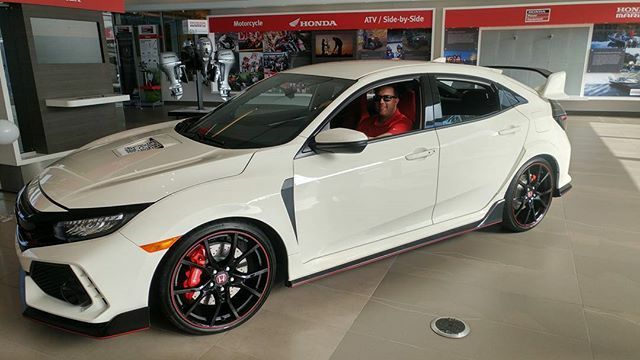 Sales and Leasing Consultant Brian Chickowski in a Honda Civic Type R found at the Honda Canada head office in Markham! If you’ve been following us for a while, you know the Henley Honda team can barely contain our excitement about the Honda Civic Type R. This 306-horsepower car is the most powerful production that Honda has ever sold in Canada, and we could not be more thrilled to announce that the first ever Type R to sell in Canada will happen next week on July 14th. The 2017 Honda Civic Type R is the all-new ultimate performance variant of Honda’s widely popular best selling car. It’s been a decade of the Honda Civic and over 2 million have sold this marks the tenth generation of Canada’s favourite car. The interior of the Type R features 2747L of cabin space, with a class-leading 727.7L cargo area when the rear seats are up. The rear seats are 60/40 split and folding seats. A 7-inch Driver Information Interface (DII) is also available in the Type R with selectable performance content to be displayed. The interior also boasts a 7-inch Display Audio touchscreen with HVAC controls integrated into the interface. You’re also able to enjoy new technologies, such as Smart Entry and Push Button Start, as well as Walk Away Door Locking and a wireless phone charger. The exterior highlights of the 2017 Honda Civic Type R feature Advanced Compatibility Engineering body structure, with a crash stroke front frame design. The Type R also features an acoustic windshield, as well as unibody structural adhesive at key points. Keeping in tune with the legacy of the Honda Civic lines, the Type R features in-vehicle connectivity that use cutting edge technologies. With the 7-inch touchscreen Display Audio interface, this model comes with smartphone connectivity and a single cable connection compatible with Apple CarPlay and Android Auto platforms. The new Civic also comes standard with a 542-watt 12-speaker audio system which can also connect to Bluetooth audio and SiriusXM. The Type R also boasts Honda Satellite-Linked Navigation System with Voice Recognition and Honda HD Digital Traffic. The DII interface includes a range of real time information that the driver can select, all designed to support performance driving. The system is able to display throttle and brake application in percentage format through graphics, and can also show turbocharger boost pressure, lap time (for use on closed circuits), as well as shift lights. Honda is known for our safety features, and they are a staple in any new generation of the Honda Civic, the all new performance model being no exception. The new performance 2017 Civic is equipped with active safety features such as Vehicle Stability Assist with Traction Control, Advanced 4-Channel ABS, Electronic Brake Distribution (EDB), and Brake Assist. Our team at Henley Honda is so excited to start selling the Civic Type R to you! The numbers are limited coming into the Niagara Region, and Henley Honda is getting them. Contact us to find out the availability!